And we are BACK with #50! Yes, we've reached the top half of the TCC100! Not to take anything away from those who have already been talked about and celebrated so far, they're just not as funny. To make it this far, people far funnier then those that judged them had to impress an impressively decisive FIVE PEOPLE... or MORE, from in and around the (mostly) Toronto-area! PATRICK: Charlie Day, everyone's favourite rat-killing wildcard on It's Always Sunny in Philadelphia, enjoyed another raucous season with his trademark FX comedy series. Day's memorable performance as Benny the Spaceman in the LEGO Movie further endeared him to fans and solidified his place among Trivia Club's top performers of 2014. RUSSEL: One of the higher entries on this list of top performers in comedy to not have the busiest years performing. Still, we can give her this spot based soley off of her Golden Globe hosting stints right? JOHNNY: Schwartz is one of those names you see in the starting credits, after the theme/starting has played, and the show itself has started, and you immediately get excited. It doesn't matter what he's popping up in, from Parks & Rec to House of Lies, the man is a scene-stealer in even the most well-known company. He's the ideal wingman in any comedic situation; cool, witty, fast paced -- he's like the funniest walking, talking twitter account. RUSSEL: Adam Scott seems to work best within a duo. Leslie & Ben. U Talkin’ U2 2 Me. Which doesn’t mean he isn’t an incredibly funny guy, thriving on the little things that entertain and blowing them up to make them funny. Boards games. U2. The opening credit sequences to long forgotten TV shows. The Greatest Moment in Television History is a wonder of modern hyperboly and love of the little things. BRIAN: His reputation as a cuddly teddy bear in comedy is well earned but he's also got one of the sharpest minds in comedy. The "300lbs Black man with the laugh of Japanese school girl" holds the record (tied with Kyle Kinane) for most wins on @midnight. His stand up is just flat out fun. You can't stop smiling when you see him. ROB: ‘What.’ is the best comedy special of the last year (technically, end of 2013), and maybe many years before that. A perfect, indescribable confluence of his set of talents and grade-A material. It would seem more revolutionary for comedy specials as a whole if it didn’t feel like only Burnham could ever pull it off. RUSSEL: Conan O’Brien still can’t stop. Being on TBS has kept him quieter in the public mind set, sure, but it hasn’t kept him from being weird and wonderful. KEVIN: If Louis CK is the reigning King of Comedy then Bill Burr is heir to the throne. Burr brings so much energy to the stage and assaults you with his blend of satire, observational, and black comedy. In 2014, Burr released his 4th Netflix special (I'm Sorry You Feel That Way) as well as a string of movie, tv and podcast appearances. 2015 should be a very big year for Burr with his own Netflix animated series in production, as well as heaps of podcast appearances. Taran Killam is Saturday Night Live. There. I said it. Sure, the current cast has many excellent standouts. But when you break it down, no matter what way you slice it, Taran Killam is the MVP of the show. He’s filled the void left by Bill Hader, Andy Samberg, and if we go back even further, he’s the Will Ferrell or Dana Carvey of the show. He’s got that everyman appeal, and he can seemingly do anything. If you look at the greatest stars of the show, they have a few things in common. First of all, they have excellent impressions. From Brad Pitt to Michael Cera, from Matthew McConaughey to Christoph Waltz—he can do them all. Secondly, the greats have memorable characters or sketches. Killan’s list is long—Les Jeunes de Paris, the Merryville Brothers, Mokiki, Boy Dance Party—and also impressive. Furthermore, Killam has never been afraid to go past the edge, seemingly having no personal limits to get that laugh. One only needs to look at his impression of Republican John Boehner in the Miley Cyrus parody “We Did Stop”. Prancing around as the uber-tanned and scantily clad Senate Leader, Killam performed with no shame at all, and ended up a discussion point of most Sunday morning news shows. He’s made his foray into other media too, starring as a voice actor in The Awesomes and also writing the comic book The Incredibles. He’s also the ultimate talk show and podcast guest, and his genuine self-deprecating humour makes him someone even Jebediah couldn’t even knock. RUSSEL: There’s something about Aidy Bryant that perfectly straddles that barrier of manic and marginalized at its funniest. Never more is it seen, on SNL, then in the Girlfriends Talk Show sketch, but when she veers either way it can still be damn funny. Whether it’s the manic star-chasing of Janine in a Waterbed Warehouse commercial, or the note-perfect rediculousness of Pam 2: The Winter Pam. SAM: Let's not talk about Let's Be Cops, which didn't deliver any of the unique comedy rhythms and qualities that make Johnston so great. On New Girl, Johnston has perfected the character of a young old man - his Nick Miller is a coot stuck in a weird past era that never existed. He befriends mute Asian men, is permanently drunk and always ornery. In short, he's a disaster of a human being, making his romance with Zooey Deschanel's Jess epically entertaining in a way no "will they/won't they" pairing has been on television since Sam and Diane. It's like watching a human car crash, and it's amazing. PATRICK: As prevalent in the world of entertainment as he is on social media, Ricky Gervais can add a Trivia Club Comedy 100 appearance to his extensive list of accolades and achievements. Series 2 of the Emmy-nominated comedy-drama Derek accentuated what was another solid year for Gervais in the world of entertainment. BRIAN: Andy is just flat our brilliant. If you haven't seen his Comedy Central series "Review' run, don't walk and dive in. One man's horrifying spiral of self-destruction has never been so excruciatingly funny. The review of "Space" ALONE is one of the most gut-bustingly funny segments of television in the past year. But then you add his various podcast appearances and his own masterful podcast 'The Andy Daly Podcast Pilot Project" which gave him the chance to just do some flat out genius character improv with some of the funniest people in comedy and it's not wonder that fans just can't wait for more. Of anything he does. RUSSEL: This is a man that has become a spirit animal. Like a majestic grizzly bear. If that grizzly knew how to work a band saw. Potentially a woodchuck? Yes, a giant woodchuck. That has a glorious moustache. Surprisingly, American Ham on Netflix wasn’t my cup of tea, but just thinking of Paddle You Own Canoe makes me want to type in the way which Offerman types. Which is, as you read his book, the way that Offerman speaks. It’s that wonderful attitude, and inherent kindness, that also helped create one of the best characters on television, in Ron Swanson. Ron Swanson, the man that launched a thousand memes and most of them based on meat. SARAH: Has anyone else noticed that Fred Armisen has lost, like, a lot of weight recently? Are you okay, Fred Armisen? I worry because I care. Armisen is an excellent band leader and great in guest roles (Comedy Bang! Bang!). I like Portlandia when I watch it, which is not consistently, but still. BRIAN: I'll see anything Mark Little is in and so should you. He was recently on the cover of NOW magazine and with good reason: his stand-up, his sketch work ("Get Some" and "We Wrote Some Improv Skits, Here's Them"), his webseries (the CSA winning "Space Riders: Division Earth" and the upcoming "Dad Drives") have all been brilliant, funny, surprising and hilariously intense. No one screams as amusingly as Mark Little. See him live any chance you get and watch his web shows so you can brag that you knew him when. JOHNNY: This man literally conquered TV this year. I've always been a Fallon fan (all the giggles! ), and will absolutely use this moment as an 'I told you he'd be a great late-night host' rub-in to everyone who doubted him during the rumours of, and his ultimately rocky start on the Tonight Show. No one can doubt it now, that he has brought a brand new appeal to late-night TV; the stale Tonight Show (that not even Conan could save) is fun again, and for a whole new generation of kids settling into adulthood. I am entirely greatful of this. The guy just has fun, and everyone else has fun along the way. LEAH: If Louis CK is the philosopher of our time, then Tig is mother Earth of comedy. No, I don’t know what that means exactly, but it is how I feel. Tig is without a doubt the most fearless comedian I can think of. She has no problem with allowing her jokes to marinate with the audience. Where so many comedians are deathly scared of silence, Tig uses it to her advantage and knows how to take a moment and really carry it through. She is real and personal and makes you laugh. I can’t think of a better combination of traits. PATRICK: The Pete Holmes Show was a veritable success during its short tenure, and it served to showcase the strength and versatility of its instantly likable host. His flagship talk show may have run its course, but Holmes is definitely heading in the right direction. When you’re this good for this long, the raised bar becomes the status quo. Even an off show is some of the best TV on TV, and a great show changes things. When Jon Stewart finishes his Daily Show run sooner then later, we'll see what he's capable of without having to produce material daily. HANNAH: My honey! My Spirit Animal! My Mother Moon! Thank you. Thank you for giving girls who talk about balls a voice in the cultural zeitgeist! Broad City has been a real game changer for me this year. It’s like someone who has actually met a 20 year old girl wrote GIRLS. We’re really poor and stupid and kinda gross and love Lil Wayne. Fantastico! That being said their writing is solid and they are really smart and I loves dat. Why did I rank Ilana higher than Abbi? Good question. A) I feel like I’ve seen Abbi before…(not actual Abbi, obviously) but a female protagonist that has her personality traits isn’t that new or exciting. Illana is different. So that’s points. B) I personally can connect with Ilana more than Abbi. I don’t know what that says about my mental health but it’s true. C) I saw their live show in September and it was pretty rough stuff but Ilana really held it together for me. There were some seriously long and overplayed bits but somehow her charm pulled through and kept it entertaining. Honestly, if you are woman under the age of 30 and you’re not watching Broad City What are you even doing here?!? I mean, everyone is funny and that's why they're on this list... but daaaaamn, what a Top 50 so far! Can it only get funnier from here on out? Well, that's a matter of personal opinion, but I like our chances! See you all in THREE DAYS, March 10th, as we shift gears and reveal #25 to #11, leaving you wanting more. Or making you realize that is a much more manageable list size to enjoy. 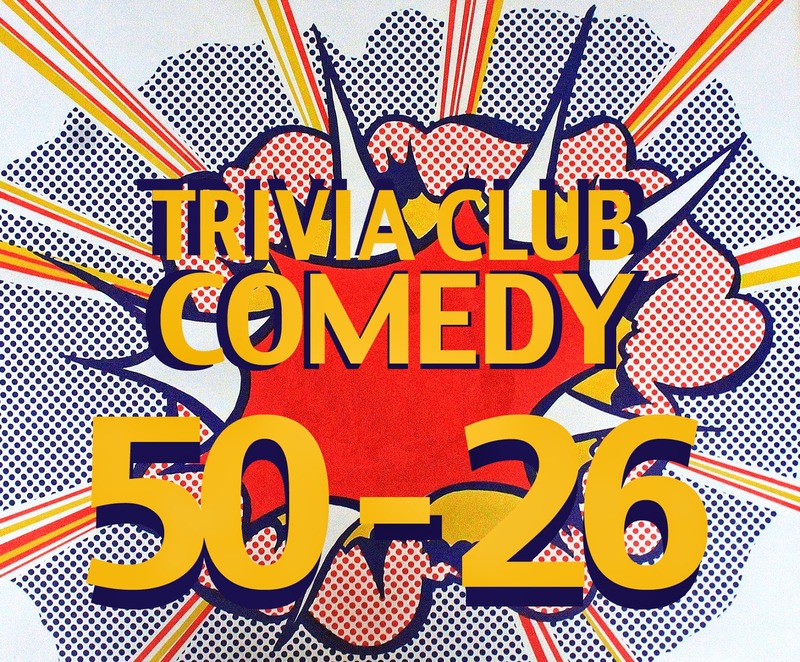 Russel Harder hosts Trivia Club at Cardinal Rule (5 Roncesvalles Ave) every WEDNESDAY, at Hitch (1216 Queen St East) every other MONDAY of the month, and Lou Dawg's near Ryerson (76 Gerrard St E) every TUESDAY!